Last week, we wrote about Little Movies a lovely iPhone app that offers daily movie recommendations. Little Movies suggests a single movie per genre, and the app only supports 5 genres, so if you’re looking for lots of different recommendations, take a look at Popcorn. 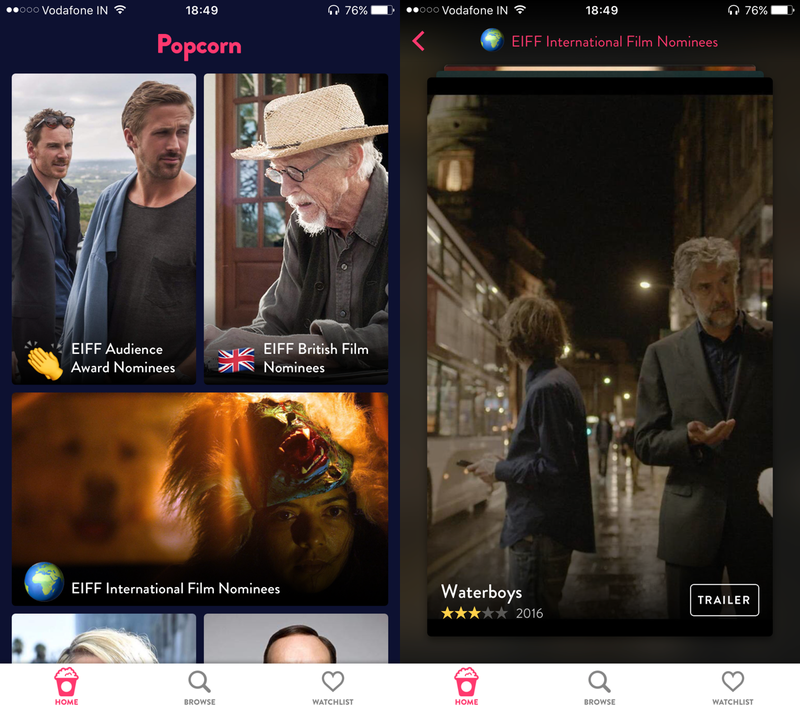 Popcorn is a gorgeous iPhone app that also offers daily movie recommendations, but does so using lists along with genres. 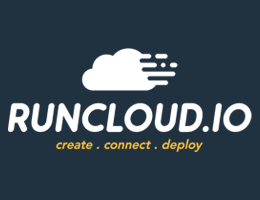 While Little Movies is designed specifically to do one thing well, Popcorn goes all the way and offers a many different ways of recommending movies for you. The Home Tab features several lists across various topics and events. For example, it currently has 4 different lists dedicated to films from the Edinburgh International Film Festival as well as one list for the Cannes Palme d’Or Winners. Similarly, you have lists like ‘X <actor name> movies’, ’13 Best Tom Hanks Films’ and ‘Remembering Roger Moore’. 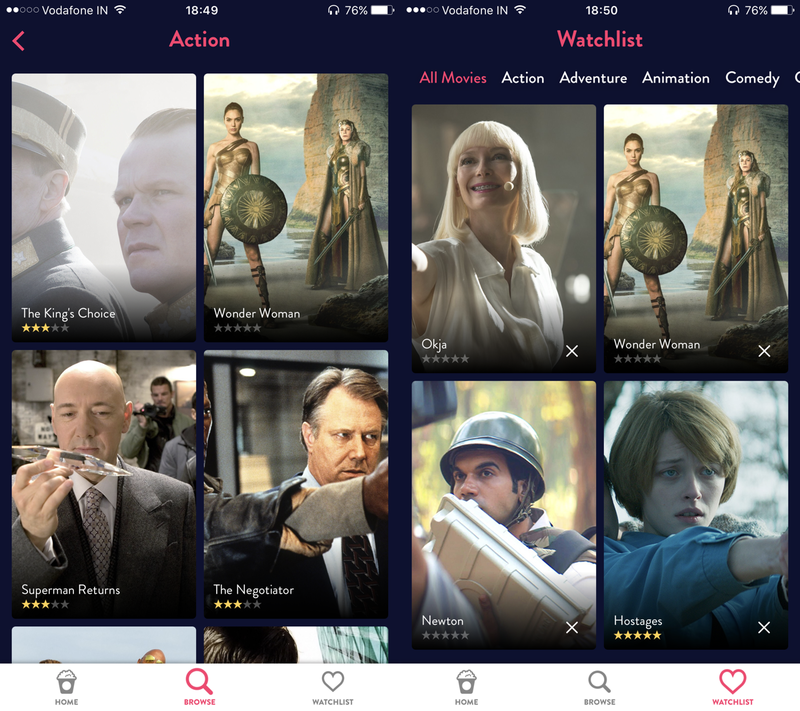 When you tap on a list, the movies are presented in a card-based, Tinder-like interface. You swipe right to add a movie to your Watchlist and swipe left to dismiss it. It’s fun to quickly go through movies like this, especially in event-focused lists. You can also use the Browse to browse movies across genres like Action, Adventure, Animation, Comedy, Crime, Documentary, Drama, Family, Fantasy, History, Horror, Music, Mystery, Romance, Sci-Fi, Thriller, War and Western. Movies are presented beautifully using large posters and look stunning. You can tap on a movie poster to view the synopsis or watch the trailer. If a movie is available on iTunes, you can tap the Watch button to rent or buy it directly. One thing I like about the app is that for movies you’ve added to your Watchlist, it allows you to filter by genre. So if you’re in the mood to watch an Animated film, you can filter out the rest with a single tap. 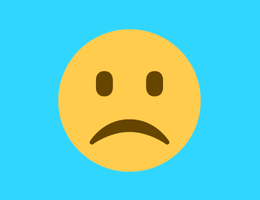 Unfortunately for Popcorn, and probably thanks to it sharing similarity in name and icon with a certain BitTorrent app, several confused and angry users have rated it poorly on the App Store, complaining that you can’t watch free movies free on the app. That said, I’d have loved to see it link to other video streaming services like Netflix, Prime Video and Hotstar along with iTunes. Popcorn is available for Free on the App Store.